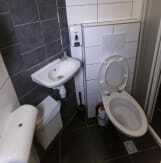 Amsterdam Hostel Cosmos is a small, friendly hostel located in the city centre of Amsterdam. 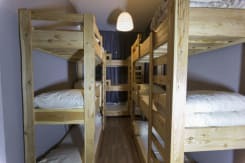 We recommend our hostel to people who enjoy a more laidback and calm atmosphere. We kindly request that all customers confirm their booking at least one day in advance of their arrival. Payment is due in full upon arrival by cash only. We do not accept credit cards. ATMs and banks are a short walk away. All nights of accommodation must be paid for on arrival or no later than 21:00 hours. On arrival it is not possible to cancel your booking or part of your booking. No refunds due to cancellations on arrival and you will lose your bed(s) for remaining days! We do not accept multiple group bookings of six or more people. Bookings made under different names for more than five persons will be cancelled! Prices do not include the 5.5% city tourist tax, which shall be added to your balance upon arrival. Please include this in your budget calculations. We have a daily lock-out from 12:00 noon to 14:30. You may check-in during this time, however. If you are more than one hour late without advising the hostel it will be presumed that you are not arriving. We have a 72hr cancellation policy. 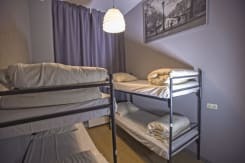 Cancellations must be made by email to Hostel Cosmos Amsterdam 72 hours prior to the arrival date (not the arrival time). Late cancellations and no-shows shall be charged the equivalent of the first night’s accommodation for weekday bookings or two nights’ accommodation for weekend bookings (Fri/Sat/Sun). This will be charged to the given credit card. In case of a booking for more than one person, pleas be aware that booker is responsible for the total amount payable upon arrival. This means that in case one of your friends doesn't come along or doesn't arrive, you will have to pay the full amount for all days and lose the bed for the remaining day(s). When one does not pay the total amount on arrival, we will charge the credit card of the booker for the total amount plus any additional costs requested by the credit card company. It is not allowed to bring visitors to the hostel. Please respect this rule as we will ask you to leave our hostel when breaking this rule. We make every effort to accommodate you in the dormitory size of your choice. However, because of the nature of our business, we may have to place you in a different-sized dormitory. As a result the balance to be paid upon arrival may be slightly different than what is stated on your confirmation. After making the reservation you will receive an email with your booking details and confirmation number. Make sure you bring this confirmation with you to the hostel. Otherwise reservation confusion will be your own responsibility. We are happy to hold on to your bags but keep in mind that we can only do it for a maximum of three hours. If you do not receive a booking confirmation from us you do not have a booking. The Cosmos management and staff reserve the right to refuse accommodation to anyone. There is a minimum of two nights’ stay at the weekend (Fri/Sat/Sun). Please note that the city tax is not included in the room rate. This 6% will be added on top of the total amount of your booking. Please note that cancellation must occur 7 days before the check-in date and any booking cancelled and/or modified after this time will be subject to a cancellation fee equivalent to the full amount of your booking. 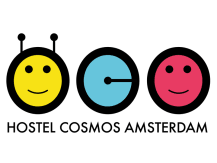 Please note that in case of a No-Show you will no longer have a room or bed at Hostel Cosmos Amsterdam. Also in this case the cancellation fee is equivalent to the full amount of your booking. 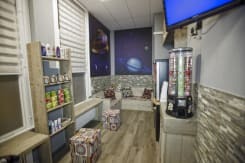 •	Hostel Cosmos Amsterdam reserves the right to pre-authorize your card after the booking is made. Please make sure there is enough credit on the given credit card to cover the total amount of the booking. Since we are working with a 1-week cancellation policy, we will charge the full amount of the reservation (including city tax) to the provided credit card during the 7 days prior to your arrival date. The booking will be cancelled if we will not be able to charge the full amount to the provided credit card. •	Checking out or leaving before your actual date of check out, will result in losing your bed(s) or room(s). •	In case of a booking for more than 1 person, you should be aware that the booker is responsible for the total amount payable. •	Groups over 6 people cannot book online but should send an email to the property. Please mention dates, number of people, mixed group (male/female? ), age range, room type preference and purpose of the trip. Then we will reply to you personally with an offer for your group. There is a minimum stay of 4 nights required between the 30th December and 2nd January. Exit Amsterdam Central Station and go to the Main Square, where you’ll find the tram stand. Take tram number 5 towards the Museum Square stop, that’s the 10th stop, Museumplein. Get off the tram and walk straight ahead on the left hand side walk. Look for a shop called Soup en Zo, located on 81 Van Baerlestraat Straat. We are located above the carpet shop; the entrance is around the corner, on69-A Frans Van Mierisstraat Street. A one way ticket will cost you € 3.80 from a vending machine, you will need some coins though. On www.ns.nl you can find all information on travel times and prices in English.